A simple system for setting and achieving your goals. Working towards your goals should be fun! I’ll show you how in this post. The new year isn’t the only time to set new goals. There’s no time like the present! You can make any day, week or month your fresh start. Perhaps you want to lose a few pounds, get a new job, or learn how to paint. Today I wanted to show you how easy it is to set and achieve your goals. 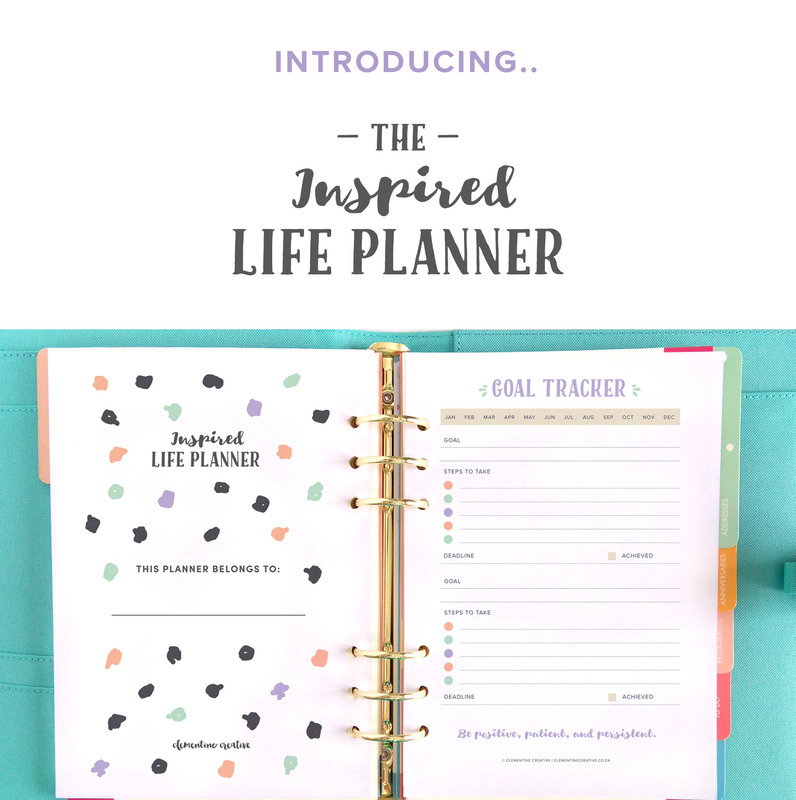 I’ll be using the pages included in The Inspired Life Planner – my printable planning kit that contains everything you need to get your life organised this year. With more than 60 pages you’ll have the tools you need to remember tasks, keep track of important info and progress and plan your year. I’ll be showing you exactly what pages you need to use, so if you haven’t purchased your copy yet, you can do so here. 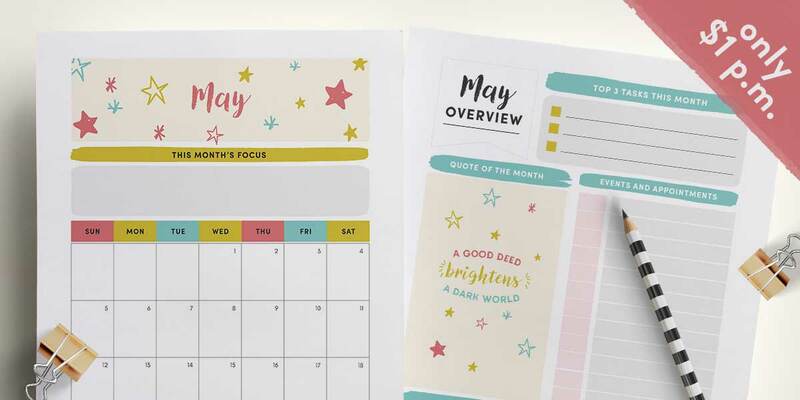 If you already have a different planner, chances are good that these pages are included in it. Feel free to following along! Let’s get started! Here’s how you can set and achieve your goals using a simple, step-by-step system. Specific: “I want to make money” is too vague. “I want to make $10000 per month by booking more clients and selling more products” is more specific. Measurable: quantify your goal. “I want to lose weight” is not measurable. “I want to lose 6kg in three months by exercising and eating healthy” is more measurable. Attainable: be realistic by keeping your schedule and every day life in mind. Relevant: to you and your life. If you want to learn Spanish but you don’t see yourself ever living in a Spanish-speaking country, then you need to revaluate. Time: set a date by which your goal will be achieved. 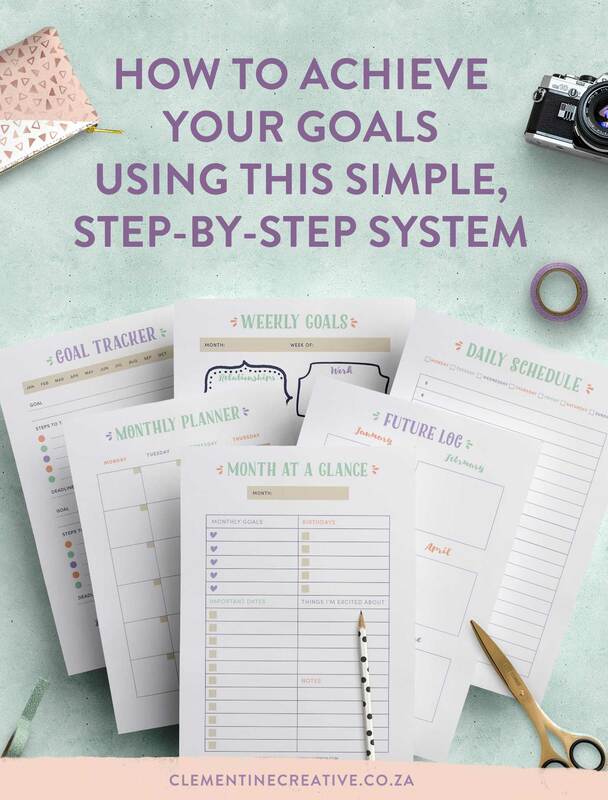 Use a Goal Tracker page to write down your big goals (page 3 in Goals and Planning PDF in Inspired Life Planner). 2. What steps do you need to take? Divide your big goal into steps. These are the steps you need to take to achieve your big goal. 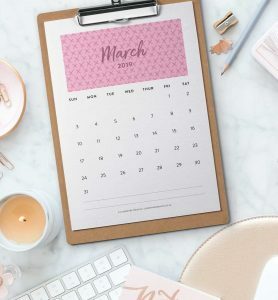 What needs to happen each month to reach your goal? – get in touch with previous clients, etc. Write down a deadline by when you want to achieve this big goal. Don’t be too strict with yourself here. 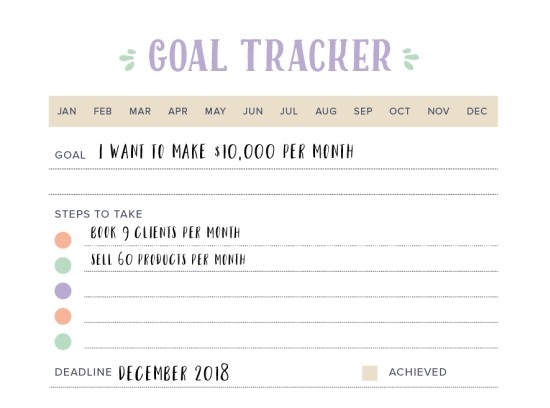 Break your goal into mini goals that you need to achieve each month. By breaking down your goal into smaller goals it will be more manageable. 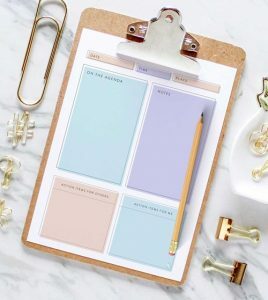 Take some the steps you’ve written out for yourself on your Goals page and write them down on your Monthly Planner or Month at a Glance page. 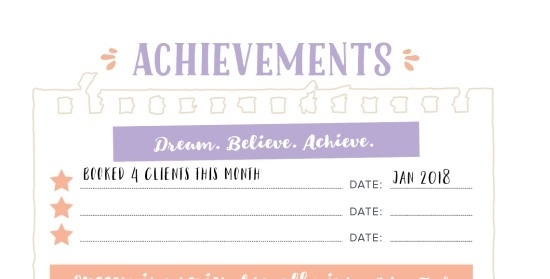 Add these mini goals to your Month at a Glance page (page 9 in Goals and Planning PDF). To achieve those mini goals, you need to break them down even further into manageable tasks that you can work into your weekly schedule. 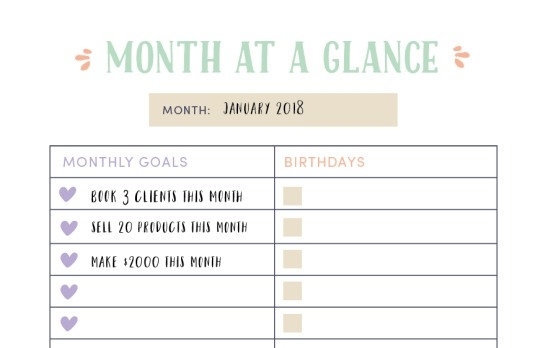 Using our income goal example, how will you “book 3 clients per month”? Your tasks may be “pitch my services to 10 potential clients a week” or “set up ads to promote my product”. 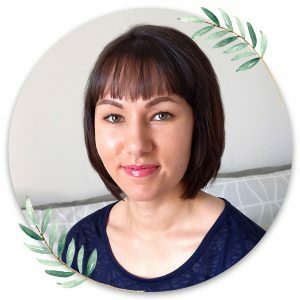 Using our “lose 6kg in three months” example, how will you “do research on an eating plan”? By writing it down and scheduling it! Nothing gets done if you don’t schedule it. 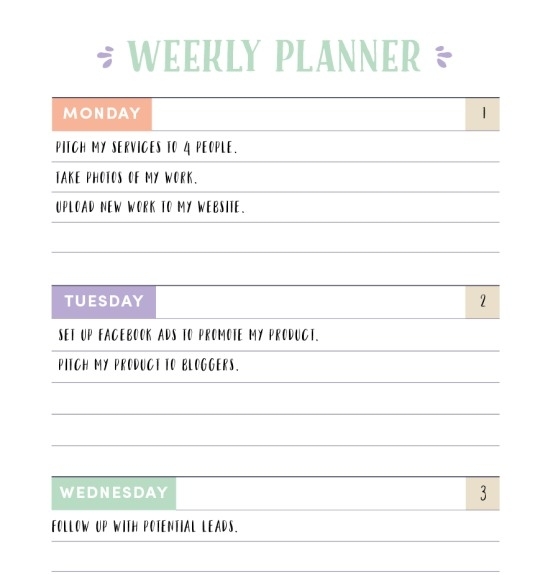 Add these tasks to your weekly planner (page 18 in Goals and Planning PDF). 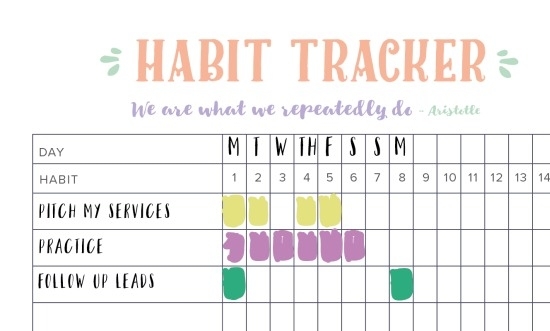 If these are the types of tasks that you need to complete daily or often, add them to your habit tracker to easily keep track of your progress (page 16 in Goals and Planning PDF). 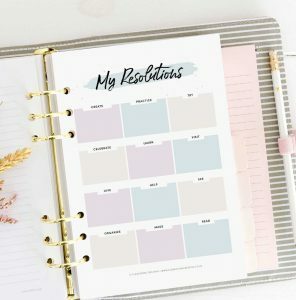 If your goal is weight loss related, the habit tracker will be perfect for tracking tasks like “HIIT”, “upper body exercises,” “lower body exercises”, “drink 8 glasses of water”, “stop eating after 19:30”, etc. As you can see, breaking down your goals into manageable tasks and physically writing them down in your planner is a surefire way to actually achieve them. It sounds simple, but many of us never write down our goals. So nothing ever happens! Log your achievements onto your Achievements page (page 7 in Personal PDF). It’s important to see how far you’ve come and this will motivate you to keep going. Congrats! You’re on your way to making those big goals and dreams a reality. 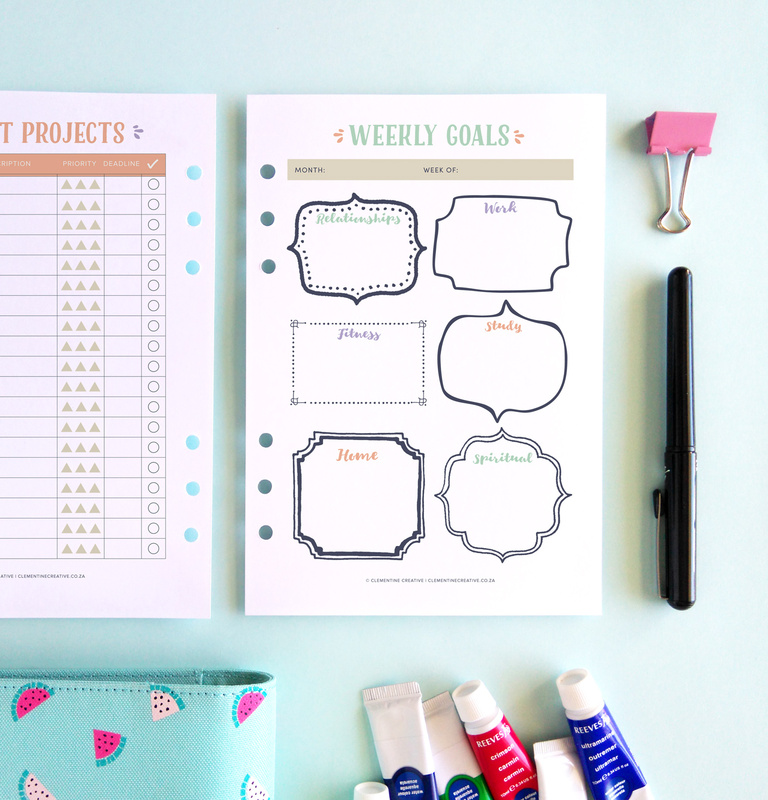 By using just printable planner pages you’ve created a system to help you set goals and work your way towards them. What are your goals? Let me know in the comments. 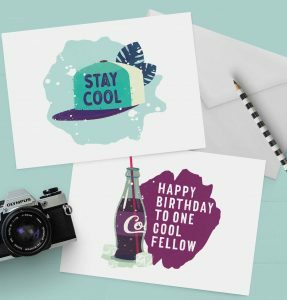 Pin the image below to Pinterest to save it for later!